Senate Majority Leader Mitch McConnell plans to bring the American Health Care Act (AHCA) to a Senate vote just before the July 4 recess. Let’s review some of the key players, the Republican strategy to move this forward, the challenges and historical context of this Senate health bill. Who is working on this bill? There are 13 Senators working on this healthcare legislation, and while the AHCA contains many changes to funding for women’s health services (such as Planned Parenthood, maternity care and contraceptives), not one of these 13 people is a woman. A Vox article I’ve seen making its way around Facebook summarized the secrecy of the legislation the best — basically, the other 39 Republicans have no idea what’s in the law. Many political scientists joke the Senate has only three speeds: slow, slower and slowest; if the Senate is able to get the AHCA to a vote by the end of June — it would no doubt be a quick turn-around. Which leads us to strategy — how will the GOP be able to push forward this legislation so quickly? The AHCA is considered a budget reconciliation bill. The choice to use budget reconciliation was itself a strategy to help push the legislation forward. After all, a budget reconciliation bill requires only a simple majority vote, prevents the Democrats from filibustering and places time limits on overall amendments, debate and motions. There are no shortage of tricks to speeding up legislation in the Senate. After all, without having at least some shortcuts, law would be made at an even slower pace — glacial even. Shortcuts mean the Senate side steps “regular order.” Under regular order, a bill is introduced, referred to the appropriate committee (whereupon the text of the bill is made public), the committees have hearings and markups (again, usually in public), after they leave the committee they go to the floor for deliberation, are committed to conference to hash out differences between Senate and House version of the bill (once again, this would happen in public) and then be sent to the president for consideration. Majority Leader, Mitch McConnell took a step to speed through this regular order and immediately place the bill directly on to the Senate Calendar through a process called Rule XIV. The challenges are certainly significant. After all, with all the secrecy it is difficult to determine whether the Republicans even have a completed healthcare plan — which will obviously be needed very soon. In fact, the bill will need to be reviewed for compliance with the Byrd Amendment, which basically states the budget reconciliation bills can only address issues dealing with the budget — if the nonpartisan Parliamentarian believes a part of the bill is “extraneous” to the budget, it cannot be included in the budget reconciliation bill. So the GOP is racing the clock — as they will need to produce a bill and have it reviewed all before the end of July. If the Senate’s bill is then found to be compliant with the Byrd Amendment, then it will need to be voted on. As we mentioned, a benefit of budget reconciliation is there is no filibuster but a downside is it requires a simple majority vote and given the current breakdown of the Senate — this may be a challenge. Currently there are 52 Republican Senators, 46 Democrats and two Independents. Assuming all 46 Democrats and both Independents vote against the healthcare bill (which is not unreasonable), Republicans can lose no more than two votes in order to still pass the bill. If they lose two votes, the result would be a tie and Vice President would break that tie. However, if the Republicans lost three votes, the Democrats would win 51-49. Given we can basically count Rand Paul (KY) as a “no”, the Republicans will need to work hard to ensure they do not lose any other Senators. With all the secrecy, there is difficulty in building consensus among Senators to pass the legislation once it is brought to the floor. Oh, and another challenge — many Americans prefer Obama’s Affordable Care Act to the AHCA. You may wonder, how often does healthcare legislation occur as a budget reconciliation process? 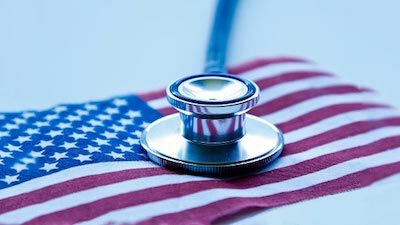 The answer may surprise you — most recent pieces of healthcare legislation have been done through budget reconciliation including: the Consolidated Omnibus Budget Reconciliation Act (COBRA, which doesn’t sound health insurance-y most certainly is, learn about it here), Children’s Health Insurance Program (CHIP), some Medicare changes and even the ACA! What about secrecy? Well that is rather unprecedented. The closest I can think of was when Bill Clinton was working towards health reform and Hillary and her group met privately to draft a healthcare plan. Though, that is not quite the same as the Senate drafting a bill in total secrecy. So go ahead, make some popcorn or pour another drink — this episode of Repeal and Replace: Obamacare will certainly leave you on the edge of your seat.